Let me preface this post by telling you that in spite of the name of this cake, there is no candy corn to be found in it. 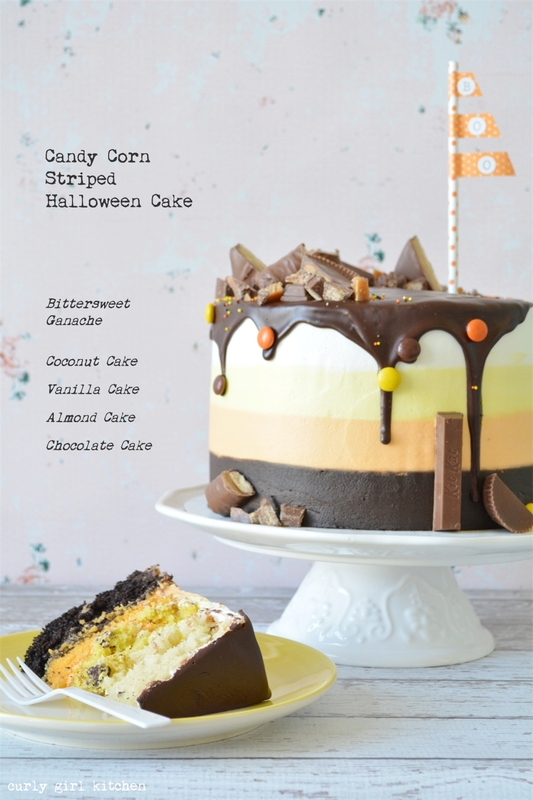 I really don't care for candy corn - it's too sugary - but I do love anything with stripes, so I took inspiration from the colors of candy corn for the design of my cake. 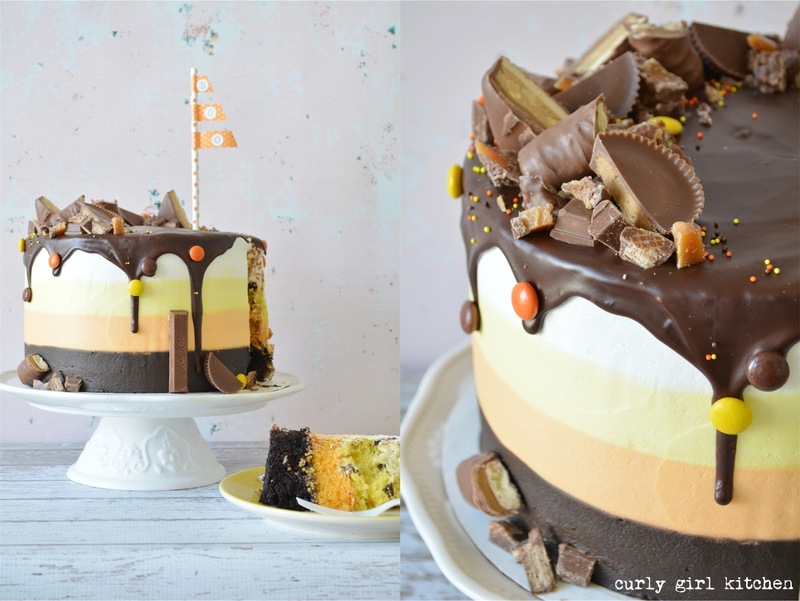 There's so much to love about this cake. Both the buttercream and the cakes are striped in brown, orange, yellow and white, and each layer has a different flavor, too. Then bittersweet ganache is poured over the cake, dripping temptingly over the sides. 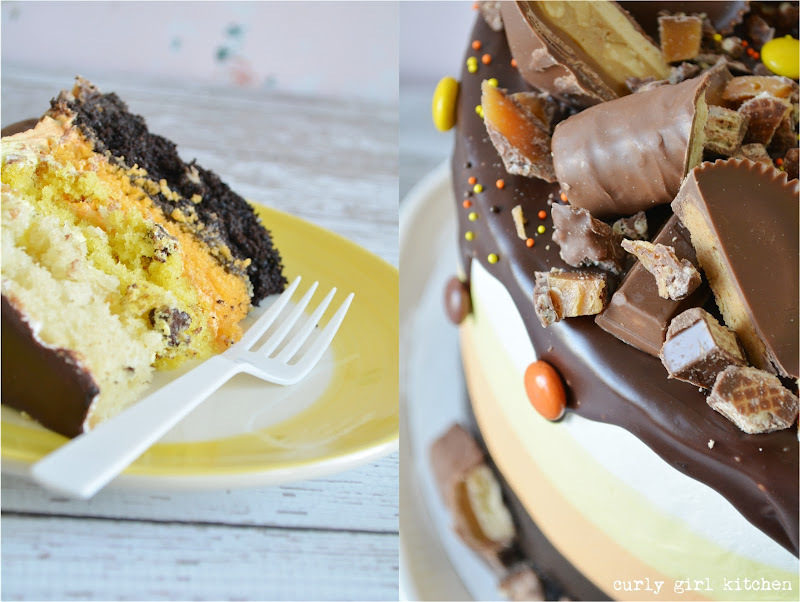 And seeing as how my husband had already opened the Halloween candy that we bought for Saturday, I decorated the cake with a handful of chopped candy and sprinkles for a fun and playful finish. Also, the more chocolate the better, right? This is where you could add a few pieces of candy corn here and there, if you like. Before you get scared off by the idea of baking four cakes and mixing up four batches of buttercream, you only have to make two. 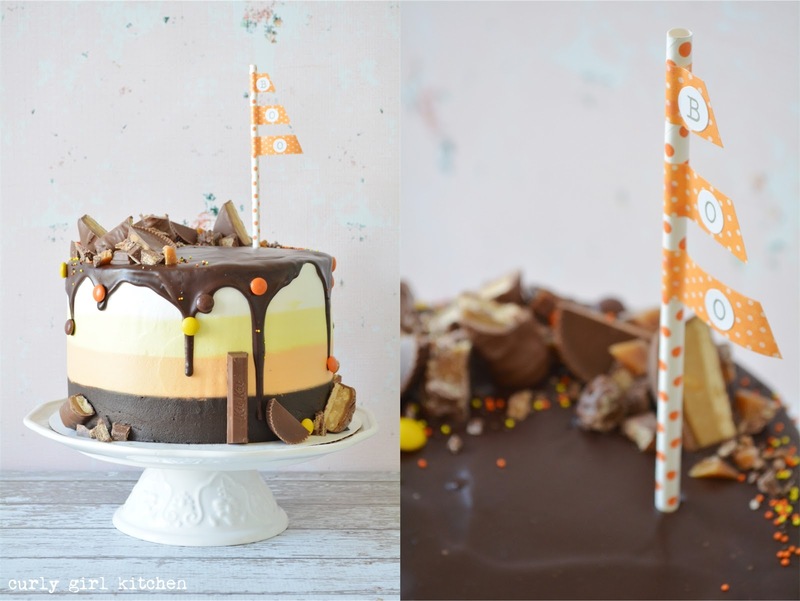 There's a chocolate layer, of course, with chocolate buttercream. But the other three all begin with a basic vanilla cake batter and buttercream, that you divide up to color and flavor. I kept the flavors complementary - chocolate, almond, vanilla (with chocolate chips), and coconut. My favorite bite was a combination of the chocolate and almond. 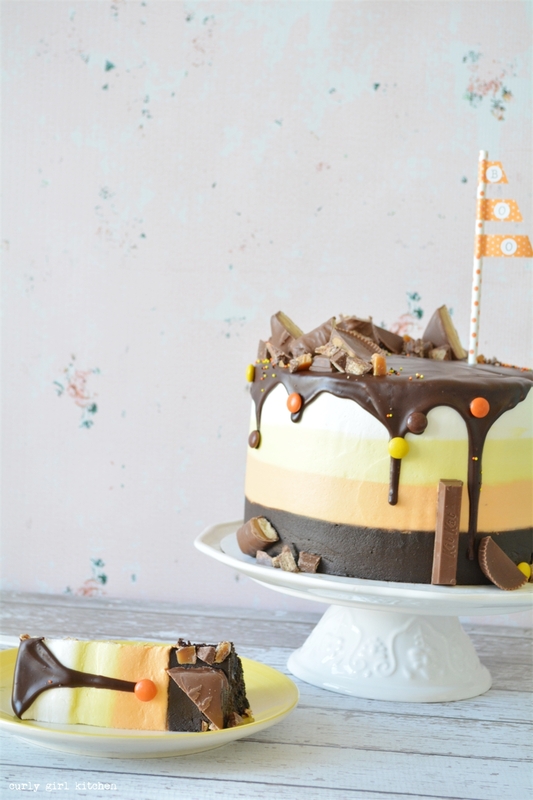 The recipe is below, and to see how to create the buttercream stripes, click here for a few tips. You can see other examples of striped buttercream in my purple and white ombre Watercolor Striped Cake, my Neapolitan Cake, the colorful Little Birdie Cake, and my Stripes and Polkadots Strawberry Rhubarb Cake. 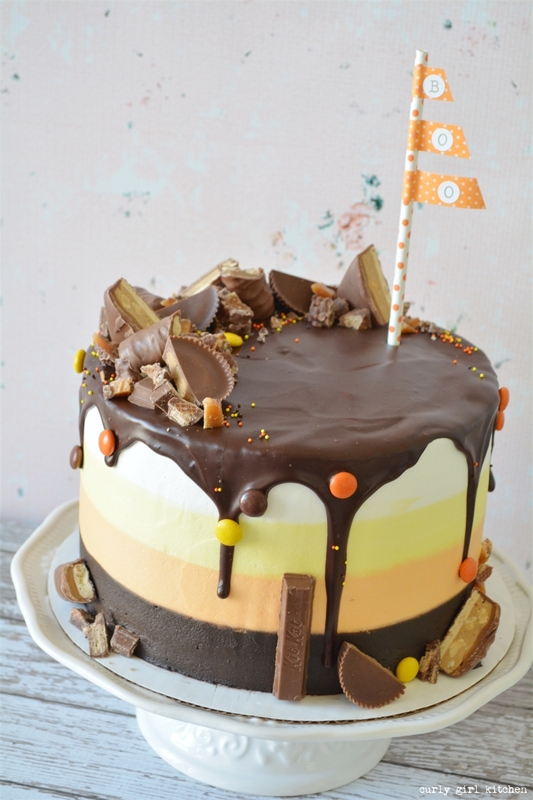 Cake for Orange, Yellow and White Layers. Preheat the oven to 350 and grease four 8-inch pans with non-stick spray. In a large bowl, combine the dry ingredients. Add the wet ingredients and whisk vigorously until smooth. Pour into one pan and bake for 18-20 minutes, until a toothpick comes out clean. 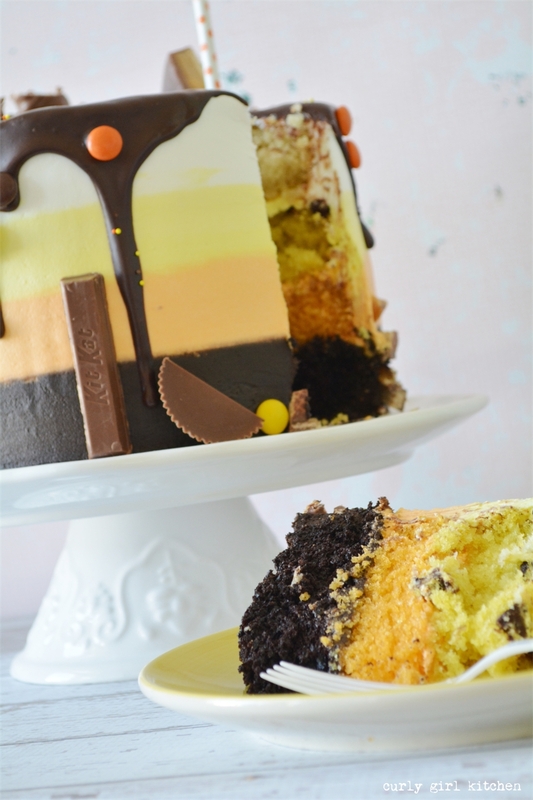 Orange, Yellow and White Cake Layers. In a large bowl, combine the dry ingredients. Add the eggs, egg whites, milk, vinegar and oil and whisk until smooth. Divide equally into three bowls. Add 1 teaspoon vanilla to one bowl of batter, 1 teaspoon almond extract to another, and 1 teaspoon coconut extract to the third. To the vanilla batter, add a few drops of yellow food coloring and the chocolate chips. To the almond batter, add a few drops of orange food coloring. To the coconut batter, add the natural coconut. Pour into the remaining three pans and bake for 18-20 minutes, until a toothpick comes out clean. Cool the cakes on wire racks, covered with clean kitchen towels, until completely cool. In the bowl of your stand mixer fitted with the whisk attachment, mix up the buttercreams by slowly mixing the dry ingredients into the butter until combined. Add the vanilla and milk and whip on medium high for 4-5 minutes until light and fluffy. For the vanilla buttercream, divide into three bowls. Tint two of them yellow and orange, and keep the third white. Assemble and frost the cake in the method described in this post, but use a separate piping bag for each color to keep the stripes clean. For the ganache, place the chopped chocolate in a bowl. Warm the cream in a saucepan over medium low heat, just until simmering around the edges, the pour over the chocolate. Stir until smooth and pour over the cake, letting it drip over the edges. 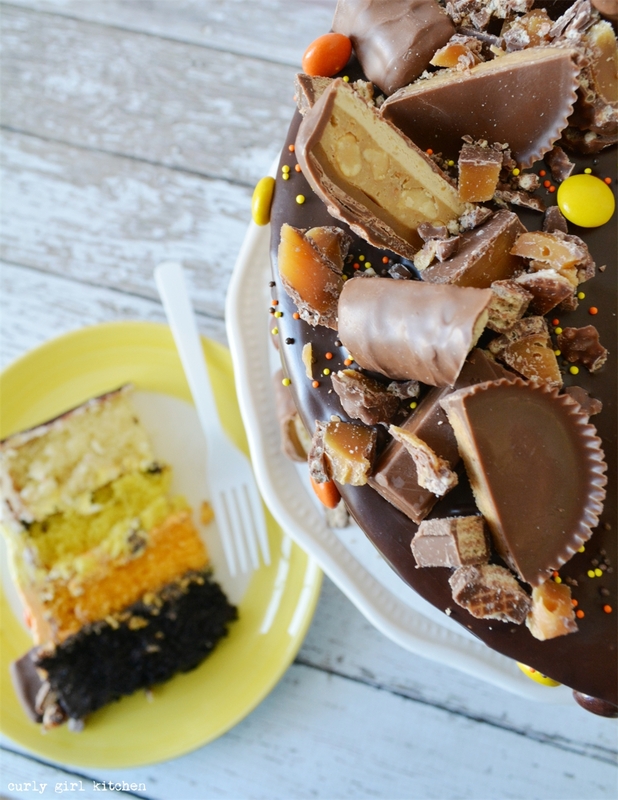 Let the ganache set for a few minutes, then garnish the cake with candy and sprinkles.